In the first of her FBI K-9 novel series, Sara Driscoll takes us into the world of the FBI’s Forensic K-9 unit. The story opens with Meg Jennings and her tracking Labrador, Hawk, pursuing the scent of a teen girl’s murderer in the woods of Maryland. Meg and her sister Cara have always been dog lovers. Cara operates a dog obedience training school, and their parents are lifelong animal advocates, running an animal rescue in Virginia. Meg and Cara have spent their lives saving animals and nursing them back to health. After they moved in together as adults, they adopted several dogs with the goal of turning them into working dogs – providing therapy or being trained in the art of search and rescue, like Hawk. Before Meg and Hawk can recuperate from their Maryland tracking assignment, they are again called into action. A bomb has exploded at the Department of Agriculture Building in Washington DC, and their mission is to find and rescue as many people buried under the rubble as possible, including a group of school children who were there on a field trip. Upon investigation, the FBI makes a chilling discovery – the method used to place and detonate the bomb is unlike any ever seen before. The bomber soon contacts a well-known Washington journalist with a cryptic message voicing his anger with the government and making it clear his goal of vengeance is not yet complete. Meg and Hawk team up with the FBI to diligently work to stop the bomber. But how many more bombs will the killer set off before his revenge is complete? Will Meg and Hawk, and the rest of the K-9 team, be able to track him down before any more lives are lost? Reading Lone Wolf, I enjoyed getting a first-hand glimpse of the world of K-9 teams and the methods used for tracking, detection, and search and rescue. Driscoll has also inserted terms relevant to K-9 search and rescue procedures at the beginning of each chapter to help clarify jargon for readers. Lone Wolf was an interesting and enjoyable read and will appeal to dog lovers and those who love a fast-paced mystery. I’m looking forward to what Driscoll has planned for book two of the series. K.L. Romo writes about life on the fringe: teetering dangerously on the edge is more interesting than standing safely in the middle. She is passionate about women’s issues, loves noisy clocks and fuzzy blankets, but HATES the word normal. Her historical novel, Life Before, is about two women separated by a century who discover they’ve shared a soul. Web: KLRomo.com or @klromo. The swampy bottom-lands of East Texas are the setting for Joe R. Lansdale’s most recent installment in the Hap and Leonard chronicles, Blood and Lemonade. It’s a “Mosaic Novel” of short stories, in which the older Hap Collins – a soft spoken, liberal-minded tough guy in a backwater town – and his best friend Leonard Pine – black, gay, and even tougher – reflect on the formative moments of their decades-long friendship. Hap and Leonard are an odd-couple sort of crime-fighting team. Upon meeting, as teenagers – at a brawl, of course, where Hap holds a gun on a mob so that Leonard can get a fair fight against a single opponent – they immediately take a shine to one another. Nobody in this part of Texas understands their bond – not their uncles, not their lovers, not their supposed friends. The two of them couldn’t care less. Racism is the unifying theme to this collection: how it segregates and divides towns, dehumanizes some while empowering others, breeding cycles of retributive violence. Lansdale’s redneck Hardy Boys come up in this rough-and-tumble, working-class landscape, where “Dad was always greasy because he always worked,” where any argument worth having usually ends in bloodshed, and where racial tensions were high. To survive such an imperfect society, Hap and Leonard form a quirky, yet perfect friendship. Against all odds, it endures. Kelly Grey Carlisle’s poignant, heartrending book is a must-read for anyone who enjoys memoirs or who hopes to write a successful one themselves. When Carlisle was an infant, her mother left her in a dresser in a hotel room. Then, her mother was murdered. This fact alone would make Carlisle’s life atypical. Yet her unique childhood was only beginning. Raised by her maternal grandfather, Carlisle’s Los Angeles childhood was spent living on a docked house boat. The source of her grandfather’s income? An adult video store. As Carlisle grows up, she yearns for more information about the mother she never knew. Her progression to womanhood is accompanied not only by the typical disillusionment of teenage years, but the realization that the narratives she’s been fed about her mother’s history may not be entirely true – and that she may never be able to find the truth. And yet Carlisle’s story is far from bleak. She writes lyrically, but with rawness and accessibly, on the wonders of childhood and on her connections with a fascinating and flawed cast of family and friends. Some of the most moving parts of the book are Carlisle’s descriptions of how she begins to find herself through the physicality of joining the swim team and the joys of expressing herself through writing. For all the uniqueness of her upbringing, Carlisle’s memoir is still inherently relatable to anyone who has ever felt like an outsider, or who has longed to know more about themselves and where they came from. Carlisle effortlessly pivots between immersing herself and the reader in the world of her child-self, to reflecting on those experiences as her adult-self. Particularly affecting is the way Carlisle writes about the concepts of memory versus imagination — try not to be moved as she imagines interacting with the mother she doesn’t remember. In her weaving together of imagined and actual experiences, Carlisle deftly engages with questions at the heart of all good memoirs: what do we remember, what in our memory is actually true, and why does it matter? Jordan Smith is WLT’s Member Services Manager. In her spare time, she writes the gluten-free food blog Small Comforts Kitchen, obsessively listens to the Hamilton cast recording, and pretends she’s Wonder Woman while trying to get better at weightlifting. She is currently at work on two novels, as well as a narrative nonfiction book about female motorists in America at the turn of the century. Eight years after Julie was silently abducted from the bedroom next to her young sister while her mother and father slept downstairs, the remaining family dynamic has persevered. Though they each carry their own private burden of guilt, the family has not quite imploded. When a young woman shows up at the door claiming to be Julie, the joy is overshadowed by the opening of old wounds, especially as Julie’s mother, Anna, begins to suspect the woman is not her daughter. Amy Gentry’s debut novel, Good As Gone, takes the genre of domestic suspense to a level of intensity rarely experienced. The superb writing explores not only the depth of the characters but the extremes of their ability to cope with the unknown or, in some cases, not to cope with what is known. The narrative perfectly balances the scalding plot progression with a definitive internal conflict of a family whose tender scars are ripped wide open. The point of view moves through the members of the family as well as the chameleon-like identities “Julie” has assumed for the sake of survival. This complex character examination is a powerful study of identity and cohesion when challenged by the extremes of physical and emotional stress. Gentry presents her protagonist’s unlikely manifestations with the humanity required to make the reader not only believe but empathize with the conviction required to keep the pages turning. The Northwest Houston setting is so accurately portrayed as to coax the reader into feeling he is a neighbor in the cul-de-sac on the next subdivision over. The novel explores cultural mores and relationships ranging from homeless street survivors, through back alley blues bar divas, to the garishly pristine power and greed of the largest mega-church pastors. If you are fascinated by the depths of depravity human beings will assume to control others, this story will amaze and horrify you. 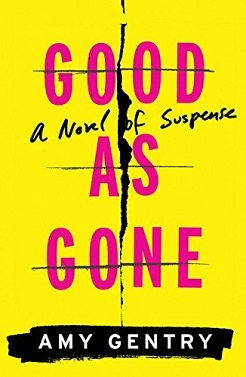 Good As Gone is a must read for fans of Gillian Flynn, Paula Hawkins, Kim Addonizio, and B.A. Paris. I rarely encounter a novel that grabs my attention to the extent that all other concerns fall by the wayside. You’ll find yourself having to remember to breathe. 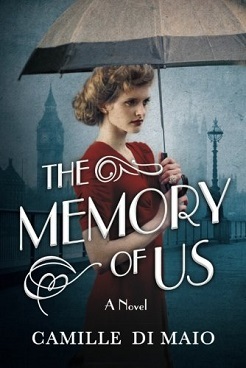 In her novel The Memory of Us, Camille Di Maio carries us away in the love of a lifetime, forbidden by circumstance and overwhelming obstacles. Julianne Westcott’s life is perfect. The daughter of an English shipping magnate and socialite mother, she has everything she needs and wants. But when she discovers a twin brother, Charles, who was institutionalized at birth – blind, deaf, and mentally challenged – she realizes her life is much more complicated than she knew. Kyle McCarthy is a landscaper’s son, living within very modest means. Julianne first meets him during a visit with her brother. While taking a break from his landscaping duties, Kyle introduces Charles to the beauty of plants, using only touch and smell. Her heart is taken with Kyle’s loving, gentle soul. But she soon learns that his heart has already been promised to another – Kyle is studying to be a priest. Julianne’s best friend Lucille convinces her that it would be a sin to seduce a boy bound to God. But even though she tries her best to forget him, Kyle never leaves her thoughts. By chance, they see each other numerous times over the next year, and each time, Julianne feels her attachment to him growing stronger. He is handsome, funny, and kind. All the things a priest should be. But all the things a husband should be as well. Even if Kyle weren’t promised to the Church, his situation in life is far beneath the approval of her parents. They would never accept her marriage to a boy without station. Julianne would surely have to choose between him and the life she’s always known. As time passes, Julianne and Kyle battle the devastation that World War II brings to England, coping with the love and loss each struggles to understand and accept. Misery loves company, they say, and if the war had brought about misery, it had also created a company of friendships that were forged through common suffering. It was bewildering to see the everyday aspects of life go on amidst such a ravaged landscape….Perhaps the most unnerving sights were the few children that remained in the city, prancing among this new concrete playground and making toys out of the scraps of someone’s former life. In The Memory of Us, Di Maio surprised me with twists and turns. Just as I was expecting the plot to take one path, it would turn toward another. The first person narrative brings the reader into the brain of Julianne Westcott, following the longing of her love-torn heart as she tries to deal with her passion for a man she can’t have. As I read, I was filled with the strong emotion of my past, as well as Julianne’s. I suffered the same struggle as a young woman – falling in love with a man whom the world didn’t see as a perfect match, but loving him none-the-less. The conflict in the novel makes the reader consider the question: How much would you give up for the love of your life? And how would you deal with the consequences? The people I’d loved, the people I’d left, their voices came back to me in a rising tide until, overwhelmed, I crumbled down onto the floor and wept with abandon. The tears burned my skin and I made no attempt to wipe them away. I was supposed to suffer – my eternal punishment – because of what I’d done. For a poignant look into the hearts of forbidden lovers who must question destiny to survive, The Memory of Us will wrap itself around your heart until you cry for what was never had, what was had and lost, and what was never meant to be. K.L. Romo is a Texas author who loves to write about the human experience, bringing awareness to people living on the fringe. Her recent novel Life Before was released in 2016. She is a member of the Writers’ League of Texas and the Women’s Fiction Writers’ Association. Please visit her at http://www.klromo.com.